It is August 25, around 6:30 pm, at about 2400 meters - I am about to reach the top of Col de la Bonhomme. I am fully decked out in GoreTex, except for my bike shoes which have long since filled with water. The trail below me has ceased to exist. The pouring rain has turned it into a muddy, churning, possibly dangerous river. My stiff-soled bike shoes struggle to find purchase on the muddy side of the trail. My shoulders ache as I push my beloved full-suspension mountain bike Casper upward, forever upward. Twelve kilos of mountain bike seemed like 20 two hours ago, and now the burden feels endless. I here Audun yell something to me, but I can't hear him properly above the driving rain. A few minutes later, we reach the top of the col. A crooked sign informs us that our Refuge is still 45 minutes away. This was a really bad idea, Molly. It is August 26, around 2 pm, at about 2500 meters. I am on the French - Italian border, on Col de la Seigne. Far, far up to my left I see the perpetual winter of Mont Blanc, snow blowing off the summer. Down here is it sunny and warm, and there are trails to ride. I shoulder my backpack, mount my bike and fly off towards Cormayeur, the weight of my backpack forgotten. We only pause to take the occasional pictures. Maybe this wasn't such a bad idea after all. Last week my handsome, charming and handy boyfriend Audun came to visit me. I took a week of vacation after my month of French classes, and I wanted to go to the mountains. 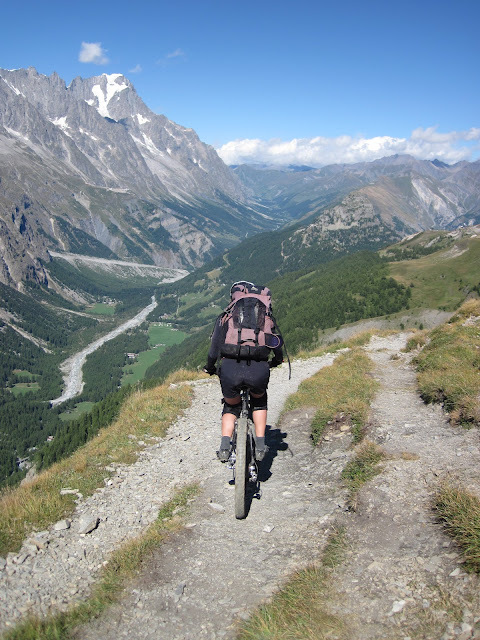 I knew Audun would agree to do anything as long as it could be done on a bicycle, so the choice fell on Tour du Mont Blanc, a well-known trekking route around the Mont Blanc massive through France, Italy and Switzerland. But on bikes. Here's the how it went. We started too late on day 1. A visit to the ZeroG bike shop in Chamonix for a new brake disc turned into a minor shopping spree, and we finally set out from Chamonix around 11 o'clock. We cruised down the road from Chamonix to Les Houches, where we took the télépherique up to Bellevue, to save 900 meters of bike pushing. From Bellevue, a steep dirt road headed to Col de Voza and further down to Bionassay. The road was loose and gravely, not the funnest biking. I felt awkward with my big backpack, and I suddenly wished I had mountain bike more in the last month. From Bionassay we zoomed down the paved road towards the valley bottom. Suddenly I realized I hadn't seen any TMB signs for a couple of kilometers. A dismal map consultation informed us that we had missed the trail turn off - and were now 3 km and 300 vertical meters below the trail. Not relishing the prospect of biking 300 meters up the wrong hill, we continued down the road to Bionnay to catch the trail later on. A few kilometers before Contamines-Montjoie, the trail finally got interesting. There were some beautiful parts along the river, and we stopped for a leisurely lunch of baguettes and sausages (of course). 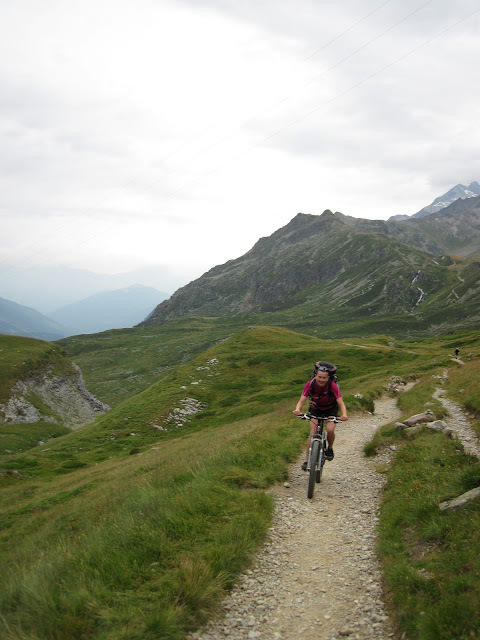 After Contamines, the trail starts to climb steeply and we got off and started pushing our bikes. Pushing a bike up a hill gets old fast. Especially if you are like me and only have muscles in your lower body. My arms tired quickly, and the uphill seemed endless. At around 4:30 we arrived at Refuge La Balme, and the signs ("The French could win the European Cup in signposting", according to Audun) informed us we still had 3 hours to go. I was starting to get pretty tired, and since I didn't want to burn out on the first day, we agreed to see if we could stay at La Balme. The proprietor's answer was a resolute "Je ne peut pas vous accueillez ce soir," (I can't welcome you this evening). Although the weather was still nice, there was thunderstorm forcasted for the late afternoon, and it seemed pretty cruel to not even offer us a floor to sleep on. This just goes to show it is important to book your refuges beforehand on the TMB. I ate some chocolate and push on upward. And then the skies opened. We put on our coats, and finally our rain pants. It rained so hard all I could see was my bike handles in front of me, and all I could think about how miserable I was. It thundered and lightening struck, 2 and 3 and 4 kilometers away, I counted. I was scared, scared of not reaching the refuge and being stuck out in this awful weather. Scared my body would just stop and I would drop my bike and slide all the way down the hill. The storm was god awful, and we were out in it for two hours. We finally reached the Refuge at 7:30, and entered the dining room dripping wet to the surprise of all the (dry) guests. They gave us soup and stew and chocolate cake, and we could barely stay awake long enough to hang up our dripping wet clothes. The morning was misty, although the rain had stopped. Breakfast was at 7:00 am, so we were forced to start early. In typical French fashion, breakfast was stale bread with jam and bowl of your choice of hot drink. I couldn't eat very much, although coffee in a soup bowl is right up my street. Chewing on my second piece of dry bread, I looked out the window, expecting to see the fog enclosing the hut. To my surprise, a window had opened in the fog, revealing a breathtaking view of the valley below. A glimpse of hope through the dreary weather. 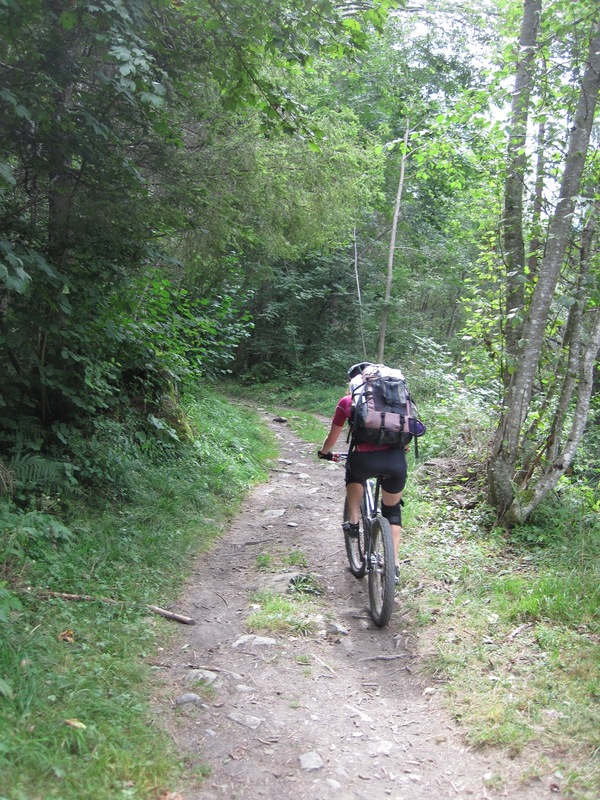 Just past 8 o'clock, we were fully decked out in GoreTex and kneepads and ready for the long descent to Chapieux. I was nervous. What if I fell and resprained my wrist? What if the descent was all rocks and no fun and the uphill turned out to be as grueling as the downhill? I rode pretty much like I felt - very cautious. The trail downhill was beautiful in some places, but diverged into deep, eroded tracks in others or dropped steeply down on slippery rock formations. I walked some, afraid to fall and hurt myself. 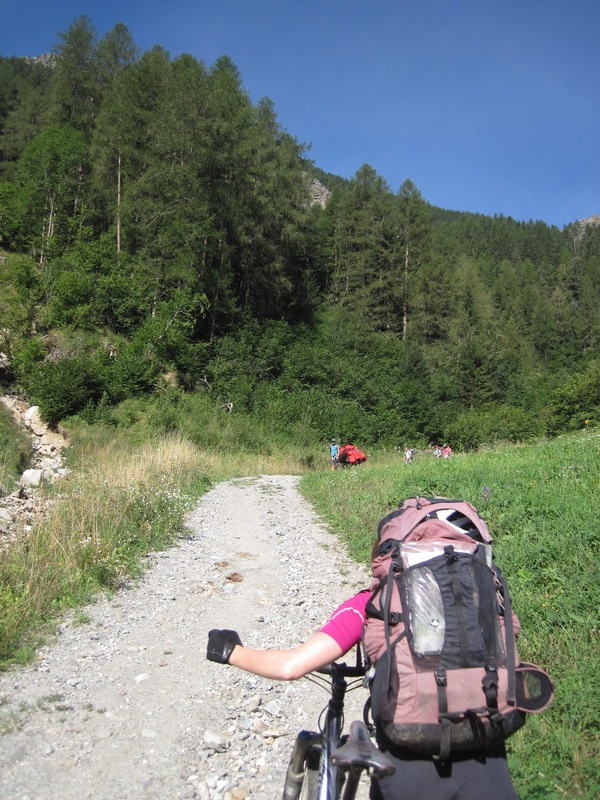 The dangers of falling are larger on a 5 day trip than on an afternoon excursion in the forest. The only good thing about being that nervous is that every small challenge feels like a triumph - the longer I stayed on the bike, the better I felt. We cruised by a large group of Japanese tourists with a French guide header upward, and they clapped and smiled. Guess we are kind of wierdos. The trail finally turned into a road, the skies cleared off, and we reached the valley bottom. There is a campground/refuge type of deal at Les Chapieux, so we stopped to refuel on a few croissants and strip to our lycra. Then we headed up the winding dirt road towards Les Mottets. This might be the appropriate time to mention that Audun rode his singlespeed on this particular trip. Yes, ladies and gentlemen, he only had one gear. One. Gear. This means that all hill climbs were intervals for him. We would play rabbit and tortoise, him running off on his one big gear while I ground slowly upward on my tiny ones. After lunch at Les Mottets, we got into bike pushing mode (that is, remove helmets and kneepads and steel yourself for pain and suffering) and headed up towards Col de la Seigne. The climb seemed endless, each hilltop bringing a new rise into view. I felt incredibly slow and heavy, but surprisingly we were passing people. The sun was shining, and each step was bringing us closer to Italy. A couple in jeans with large SLR cameras trotted down the trail towards us. "Good job! ", they said in English, clearly Americans, "Only 500 meters to the top, you'll be able to see Italy soon." Fifteen minutes later we found Italy, and could see the top of Mont Blanc blowing in the wind. We donned our downhill gear and cruised down to Refuge Elisabetta. The trail this time was smooth and the going easy, although the Italians had placed several 'bicycle traps' - wooden drains to prevent trail erosion that disrupted the flow of the trail. The trail flattened out into a rock-strewn dirt road towards the base of the Miage glacier, and hikers greeted us in both French and Italian. At the base of the glacial moraine, we faced a choice: cruise down the road to Courmayeur, or take the true TMB route over the mountains. 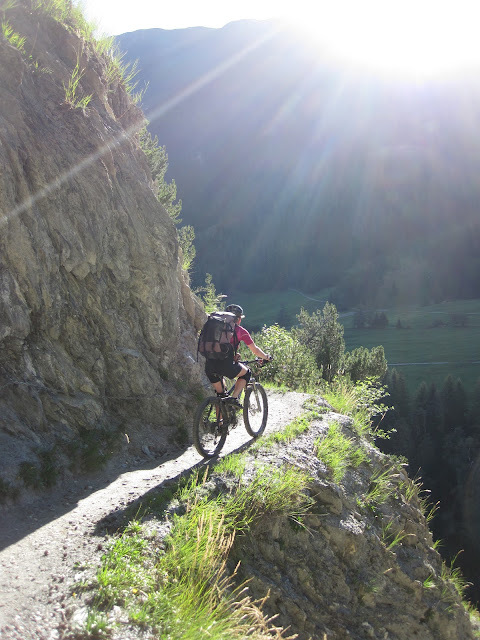 This route involved climbing a further 400 meters, but would then take us across a mountain plateau, and, we hoped, some fun trails down to Courmayeur. So of course we went for the trail. I downed three mini Snickers before starting the bike push uphill, but still felt heavy and tired immediately. The sun beat down on us, unlike the day before, and heat made me go to sleep. "I just want to lie down in the grass and take a nap!" I complained to Audun. "We could sit down in the grass if you want to", he answered. I sat down and slept for 20 minutes on his lap. It was great. Two mini Snickers later, I was ready for the last 200 vertical of the climb. 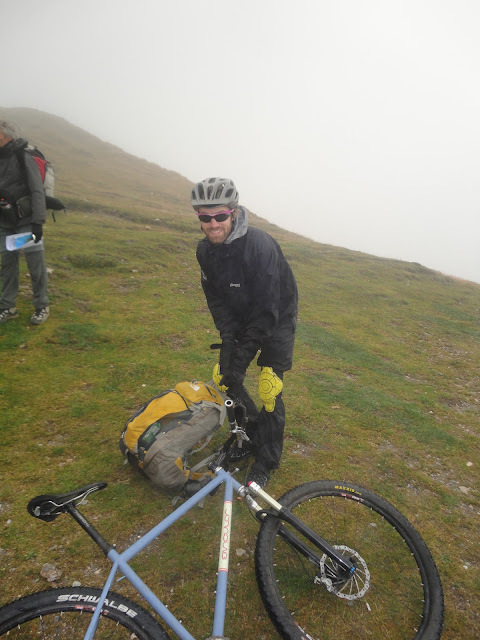 We pushed our bikes past a crumbling hut and up a ridge until it flattened out. The Mont Blanc massive was directly across the valley, shining tantalizingly in the sunlight. The valley we had left was 400 meters directly below us; this would not be a descent for the faint of heart. On top we met an Italian cyclist who assured us that the descent to Courmayeur would be "very good, very fun on bikes." I got wicked excited. 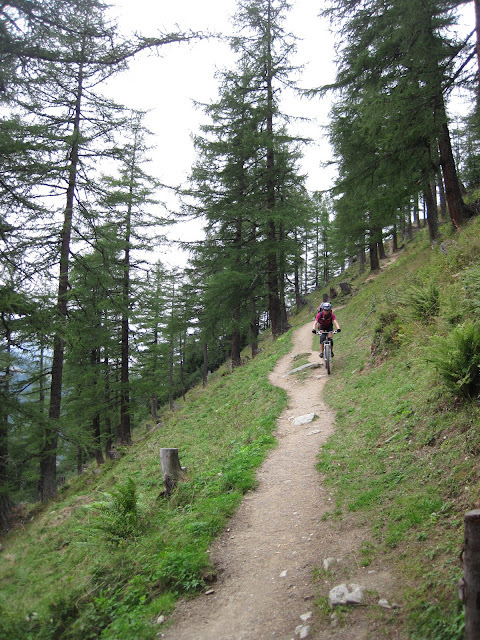 The descent started with a few km of awesome, exposed singletrack across the plateau. From the top of the ski lift it was less interesting, mostly steep dirt road that heated up my discs until I could have used them to fry eggs. 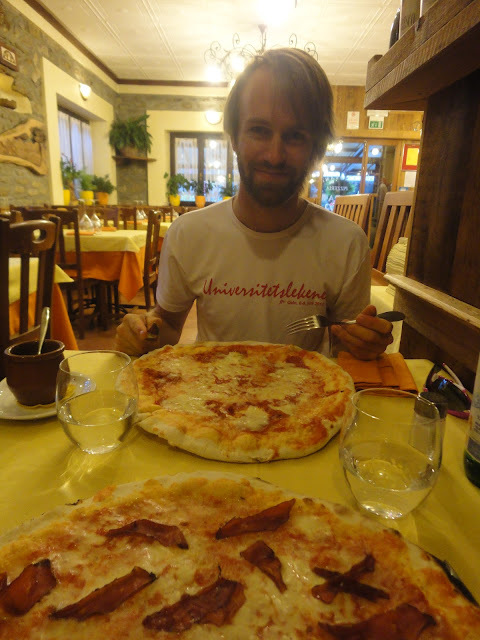 We hit Courmayeur around 5 o'clock, settled into our hotel, and went out to find food. After a half an hour of indecision and confusion ("What, this place doesn't open until 8 o'clock? Aren't they hungry?! "), we finally found a pizza place and ordered two large pizzas. When the waiter asked me if I would like "piccante" (spicy), I said yes, and he came out with a pot of chili oil, and I proceeded to drizzle it on my pizza. I repeat: if an Italian asks you if you want "piccante", back away slowly. Pizza, with the evil pot of chili oil on the left edge of the picture. I spent the next half an hour choking down the spicy pizza until I couldn't feel my mouth anymore. Audun just laughed and asked why I hadn't tried the oil on just a little piece. That would have been a good idea. The next day dawned chilly. We set out from the hotel around 9 o'clock, and the valley was still in the shadow of the mountains. The sun on the tall peaks above foretold a hot day. From Courmayeur, we left the TMB for the first time (on purpose, we missed the turnoff on the first day and lost TMB for an hour or so). 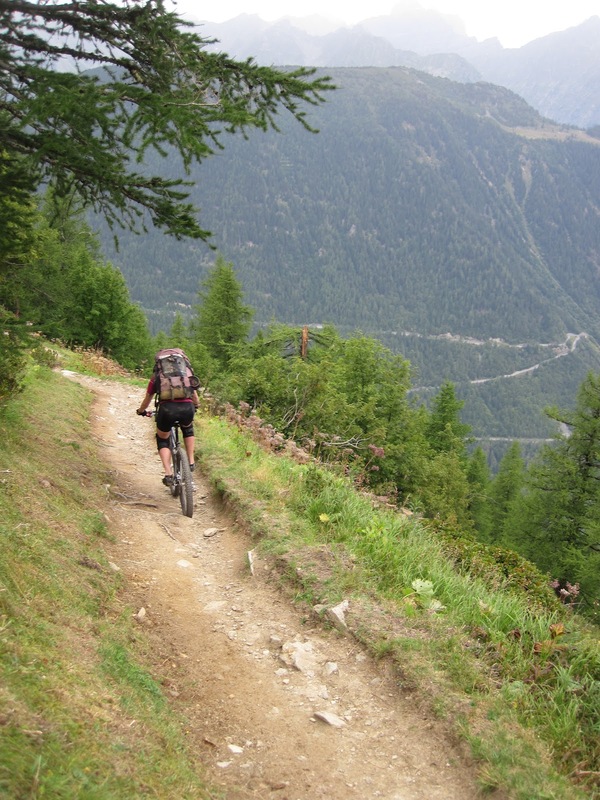 Following this guide, we decided to pass up the climb to Rifugio Bertone and instead ride the road to Rifugio Elena, all the way up through Val Ferret. We joined the TMB trail again at Rifugio Elena. At first, we were on the main road out of Courmayeur, and were surrounded by cars. 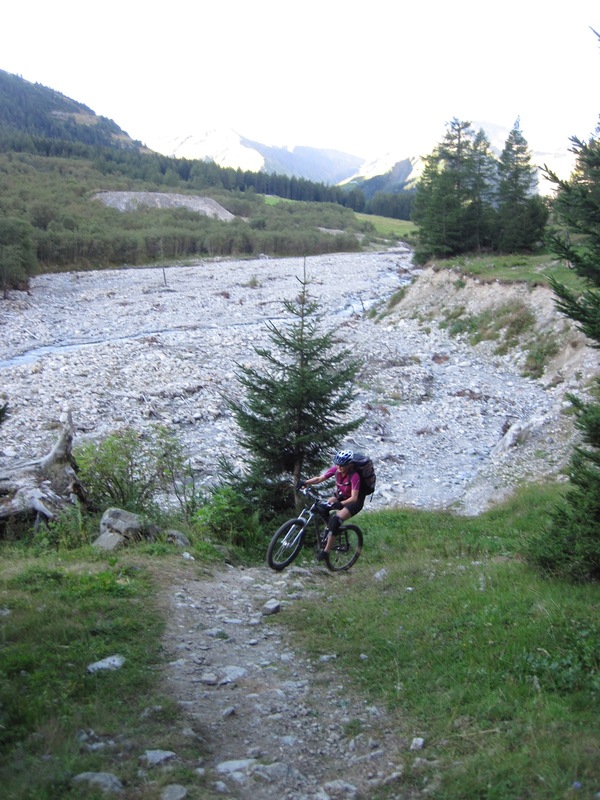 As we climbed up into Val Ferret, the road grew smaller and forested. There were still a surprising number of cars for such a small road, but the beautiful scenery and the ease with which we climbed the first 600 vertical meters made up for it. It was nice to climb on the bike for a change. The last 2 kms into Rifugio Elena were a steep, winding deep road that I was just barely able to ride on my smallest gear. Audun, who (still) only had one gear, walked parts of this. The sun was high in the sky by the time we reached the hut, and we enjoyed a quick lunch outside on the grass before starting up the trail. Pushing our bikes, again. It actually turns out that bike pushing gets easier. By day 3, even though my muscles were tired, I was getting used to the feeling of pushing my bike. You just have to settle into a slower pace, find a rhythm. Another fun thing about pushing a bike is that you get a lot of sympathy from hikers. "Go go, you're doing so well!" A couple short hours later, we were on top of the Col du Grand Ferret, on the Swiss border. I was still scared of a technical descent, although many hikers had told us that the trail should be good. And again, looked down at the trail below, my fear was replaced with excitement. Kilometers of hard-packed, beautiful trail stretched out below us. The wind blew steadily across the top of the col, and only had the patience to take a few photos of the spectacular scenery around me before I was ready to go, go, go! Audun was, as always, the photographer, speeding ahead of me to stop and take pictures. The trail was exposed, again, with the hill drop off steeply on our right side. But the trail was good, so I could mostly stay on the bike. 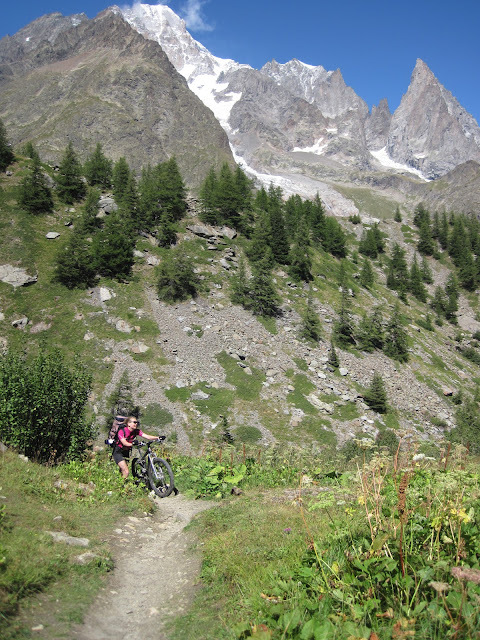 From la Peule, we avoided the road by following more single track across the valley side. I was very jumpy on this section - falling in some places would mean sliding several hundred meters, probably intertwined with my bike. The trail was pretty narrow, but still mostly bikable. We arrived at Gite de la Léchere fairly early, and had time to shower and relax before the hostesses served us incredible raclette (melted cheese with potatoes, pickles and onions) for dinner. This was the best meal on the trip, and I regret not taking any pictures of the two Swiss woman melting the raclette cheese for us - they were working hard to feed the 30 odd people at the hut! Breakfast was refuge-style, meaning early and involving more partially stale bread and jam. Again we had the choice between a road or a trail, and again we decided to try the trail. Because trails are fun! The TMB between La Fouly and Praz de Fort is partially forested dirt road, partially rock and root strewn trail, and all slightly downhill. This makes for great fun, especially if you (like me) are on a full suspension bike, and can just roll over most of the technical parts. Casper the steamroller. He ate those rocks. Just outside of Praz de Fort, we ripped by a large group pushing their bikes up the hill we were headed down. Ah, the feeling of seeing others pushing their bikes as you enjoy yourself! I would, of course, be pushing myself soon. On the start on the hill to Champex, we met a group who had a mule to carry all the things (see the red in the background of the picture?). That's cheating! The climb up to Champex was steep and winding, and when we reached the village around lunchtime, as ravenous as two wolves. After buying enough cheese, sausage and potato chips to feed an African village, we went to the local boulangerie to buy bread. We purchased 6 miniature loaves, thinking that this bread would be airy like all the other bread we had eaten, and that we would need lots of bread to fill up. The bread was dense and filling, and only managed to finish one loaf between us. Before leaving town we gave away two loaves to a friendly British family we had met the night before. This saved us carry an extra kilo of bread. The last bit up to Bovine was ridable. Sweet view! The trail out of Champex followed the road towards Martigny, before turning into a side valley and climbing steeply upward. The trail had clearly be remade recently, and the new trail was both steep and made of loose dirt, which will probably settle in a year or so. I actually carried my bike instead of pushing for a while because the trail was almost too steep to push. After a couple of hours we reached the precariously positioned farm of Bovine, and were ready to conclude the day with a descent. This turned out to be my favorite descent on the whole trip. It was steep, it was gnarly, rocky and twisty. I had to walk some. But ultimately it was the first time I felt like I was used to my big backpack, and could really challenge myself. I found myself grinning at every turn. You can do this! You are a bike goddess! Gogogogo! 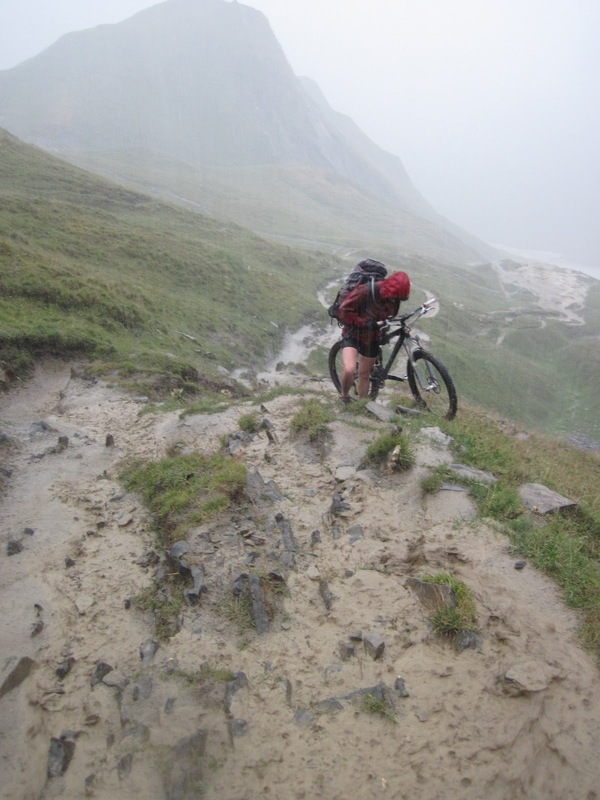 And then it was all over, and we reached Col de la Forclaz were we spent the night. The hotel is a little run down, and decidedly more touristy and less charming than refuge accommodation. You can drive to it, after all. This day was rather short, and not quit as spectacular as the others. We cruised down the road towards Chamonix, and then turned off and followed the dirt road up to Les Jeux and Col des Posettes, foregoing the regular TMB route. We were able to stay on the bike for about 95% of the climb, a welcome change to the all the pushing. On top of Col des Posettes, looking back down into Chamonix valley. 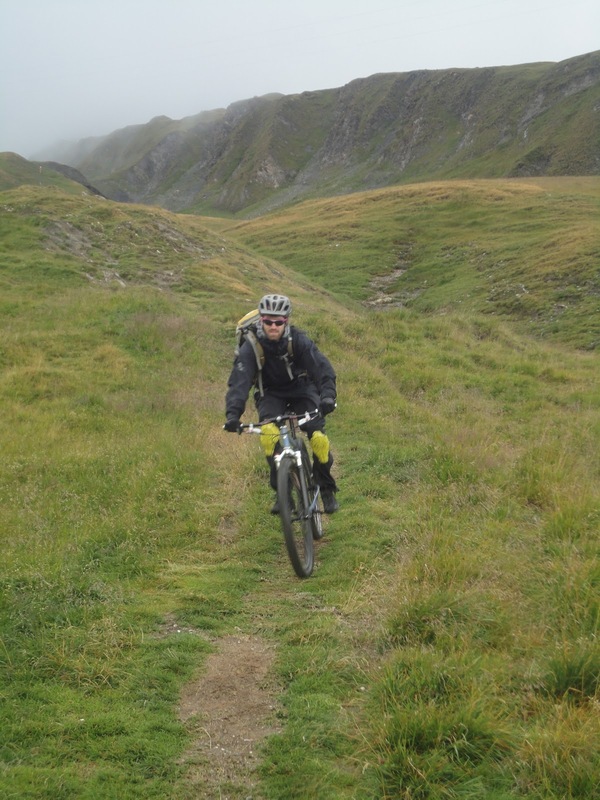 The descent to Le Tour was a steep dirt road, although Audun took a downhill bike trail which I avoided because I didn't want to be forced to go over any jumps. Afterwards we cruised down the road to Chamonix, and relaxed and ate until we could catch a train back to Grenoble. 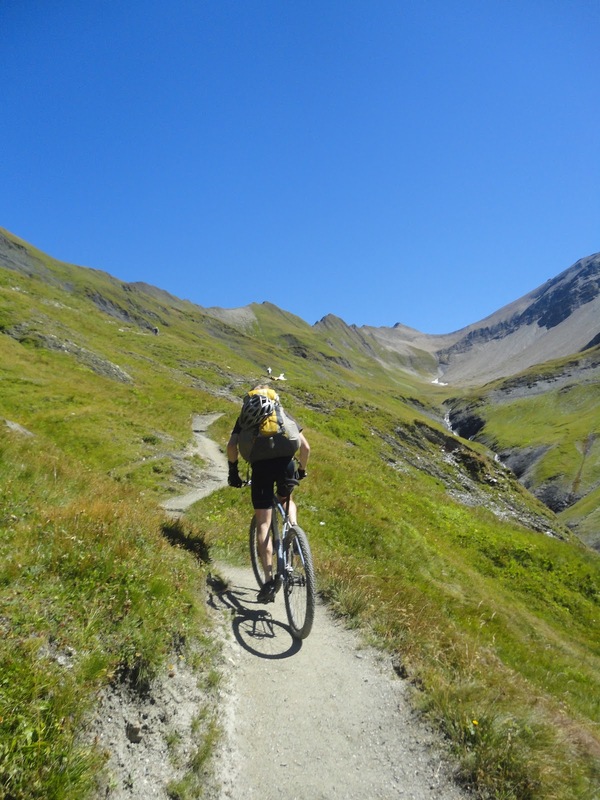 Tour du Mont Blanc is a stunning bike ride, and given the right weather five days is about the right amount of time as this gives you approximately one big col every day. Although I was glad I was prepared for bad weather (re: extremely rain the first day! ), I wished I had carried a slightly less heavy backpack. I probably only needed two t-shirts, for example, and several items, like my deck of cards, went unused. All the other bikers we saw on the trail were carrying much less then us; this lead us to question whether they were truly prepared for mountain weather. Even though you can stay in clean, dry refuges every night, it is important to be prepared for the worst case scenario. Awesome, Molly, sounds like a great trip and a true accomplishment. But that Audun guy? No gears?????? He's NUTS! Sounds like a great adventure! Do you think the trails would be open in June? TMB is definitely one of the coolest things I've done on a bike! I'm not exactly a local, but I would guess there's still a fair amount of snow, depending in the high passes in June. Probably better to wait until July. Nicely told! We also did "The Tour", just a week ago. It seems we took another route. Thanks! Yes, your route looks like it was slightly different. For example we bypassed Refuge Bertone completely, although in hindsight I regret it a little. This was one of my favorite trips, ever, so I'm glad the report is still being read!